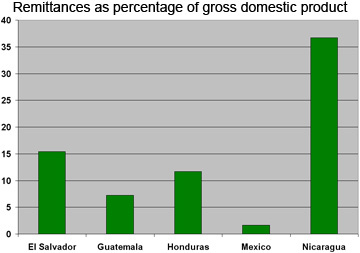 Can remittances and globalization help the environment? Globalization and other economic trends appear to be helping the degraded forests of El Salvador recover, reports new research that evaluated the impact of global trade, land policy changes, and remittances on forest cover. The study, by Susanna B. Hecht of University of California at Los Angeles and Sassan S. Saatchi of the California Institute of Technology, used socioeconomic data, land-use surveys, and satellite imagery to document significant increases in the area of El Salvador covered by both light woodlands and forest since peace accords were signed in the warn-torn country in 1992. The results may seem surprising to many conservationists who most often associate globalization with deforestation and degradation of old-growth forests. Hecht and Saatchi argue that the role of economic and social trends like globalization and remittances on forest recovery have so far been overlooked. Percentage tree cover in El Salvador, derived from (top) AVHRR (Advanced Very High Resolution Radiometer) at 1-kilometer spatial resolution in 1992 and (bottom) MODIS (Moderate Resolution Imaging Spectroradiometer) at 500-meter resolution in 2001. Image modified from Hecht and Saatchi 2007. 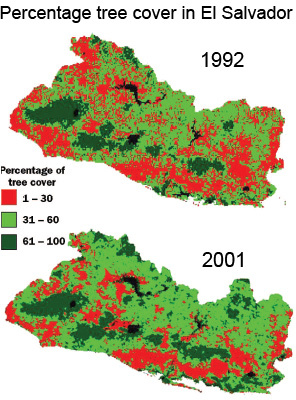 Comparing changes in woody vegetation derived from satellite data in each province in El Salvador with population data, the distribution of average remittances, and the percentage of households receiving them, Hecht and Saatchi developed a model to test the relative impact of population and remittances on forest cover. They found that “for every percentage point increase in remittances, there is a 0.25 increase in the percentage of land with 30% or more tree cover.” The correlation was even stronger in areas with higher tree cover. Unexpectedly, the researchers found no correlation between correlation of forest cover and population density. “Remittances may be especially important for woodland recovery in El Salvador, enabling people in rural areas to buy food without all of them needing to grow and sell it,” they write. Hecht and Saatchi say the war drove growth of remittances by causing roughly one-sixth of the population to flee the country, mostly for the United States. These migrants, who largely abandoned the countryside, would later send money back to relatives who remained in the Central American country. During this time farms and ranches were abandoned and El Salvador came to rely on food imports. Meanwhile, rebels used the forest as a strategic defense, preventing peasants and commercial farms from clearing forest or maintaining farmland. Due to cattle ranching and agriculture, by the 1970s less than 6% of El Salvador’s natural forest was considered undisturbed, according to the authors. Land redistribution under the peace accords — which gave landowners secure titles to holdings — also had a strong influence by encouraging farmers to better manage natural resources. Today the vast majority of farmers in El Salvador are smallholders. Many of them participate in mixed-production systems that maintain a diverse matrix of agricultural landscapes and regenerating forest lands. This system supports higher levels of biodiversity than conventional monocultures or cattle ranches. “These small farms have an important role in household provisioning and create a highly structurally and ecologically diverse countryside, especially because El Salvador’s coffee forests maintain a much more diverse overstory than is characteristic for most of Central America, and are largely low-input or organic systems” Hecht and Saatchi write. Hecht adds that the multiuse strategy complements the natural ecology of the region which is often buffeted by storms, floods, and other disasters. As forests continue to recover, rural populations may see other forms of income from the restoration and maintenance of ecosystem services. Long cast as villains in the tropics, Hecht and Saatchi argue that rural farmers should be viewed by conservation groups and policymakers as key partners in encouraging forest resurgence. The authors suggest that large environmental gains may result from establishing payments for environmental services, reducing taxes on remittances, and promoting technical transfers and innovations to support ecological projects. 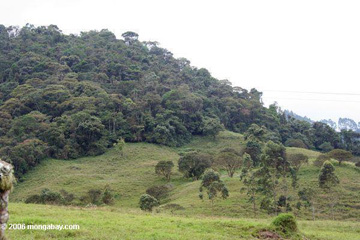 Biodiversity conservation is often associated with the protection of charismatic animals and beautiful landscapes. 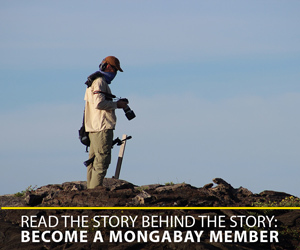 Missing is consideration of the role that biodiversity plays in the livelihoods of hundreds of millions of people around the world, who rely on hunting, plant collection, and other services afforded by biodiversity for everyday subsistence. Humans are among the most successful of Earth’s organisms. Living in every habitable, and sometimes uninhabitable, space, humans dominate the planet’s surface and have become a global force that alters natural ecosystems, species distribution, and climate. Virtually no wilderness areas have escaped man’s influence. While past conservation efforts have focused on preserving “pristine” wilderness, it is increasingly apparent that few such areas exist. Recognizing this, present conservation efforts are increasingly looking at how human use fits into protected areas management. A new paper published in Biodiversity Conservation traces this shift in conservation philosophy since the 19th century. Reviewing the history of four main conservation approaches, Michelle Kalamandeen, a biologist at the University of Guyana, and Lindsey Gillson, a botanist at the University of Cape Town, conclude that current conservation efforts are integrating elements of each philosophy, resulting in a new conservation ethic that uses alternative criteria for designating and managing protected areas, and recognizes the importance of man’s influence in wilderness areas. In recent years, scientists have warned of a looming biodiversity extinction crisis, one that will rival or exceed the five historic mass extinctions that occurred millions of years ago. Unlike these past extinctions, which were variously the result of catastrophic climate change, extraterrestrial collisions, atmospheric poisoning, and hyperactive volcanism, the current extinction event is one of our own making, fueled mainly by habitat destruction and, to a lesser extent, over-exploitation of certain species. While few scientists doubt species extinction is occurring, the degree to which it will occur in the future has long been subject of debate in conservation literature. Looking solely at species loss resulting from tropical deforestation, some researchers have forecast extinction rates as high as 75 percent. Now a new paper, published in Biotropica, argues that the most dire of these projections may be overstated. Using models that show lower rates of forest loss based on slowing population growth and other factors, Joseph Wright from the Smithsonian Tropical Research Institute in Panama and Helene Muller-Landau from the University of Minnesota say that species loss may be more moderate than the commonly cited figures. While some scientists have criticized their work as “overly optimistic,” prominent biologists say that their research has ignited an important discussion and raises fundamental questions about future conservation priorities and research efforts. This could ultimately result in more effective strategies for conserving biological diversity, they say.